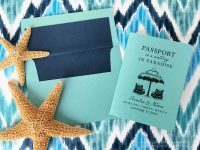 Passport invitations aren’t only for destination weddings. 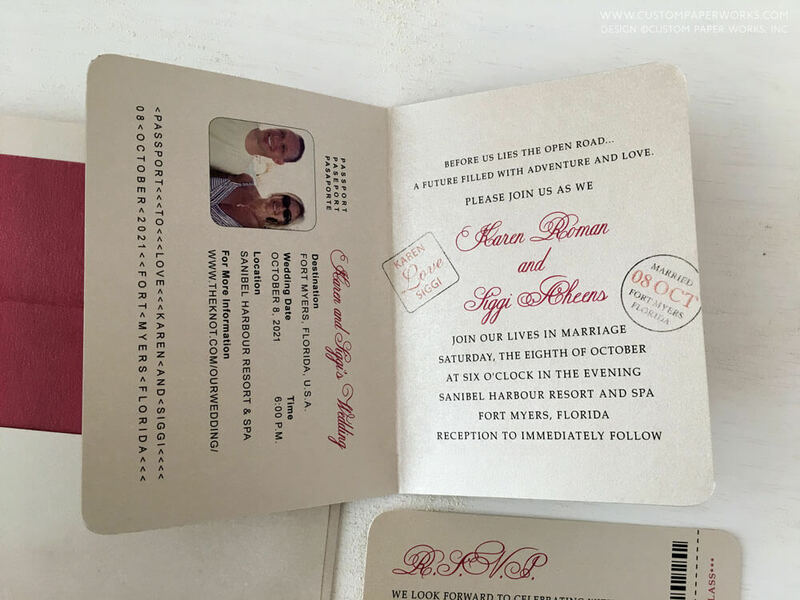 I design and produce lots of invitations in the form of a passport for hometown weddings with a travel theme. Couples who love to travel, who met while traveling (or while working their travel-related jobs – pilots, flight attendants, bloggers, photographers, professional speakers…), or couples taking off on a worldwide adventure after their wedding tend to find a way to incorporate the theme into their wedding. This couple had already decided on suitcases as a design element for their wedding and knew their wedding cake was going to look like stacked suitcases. 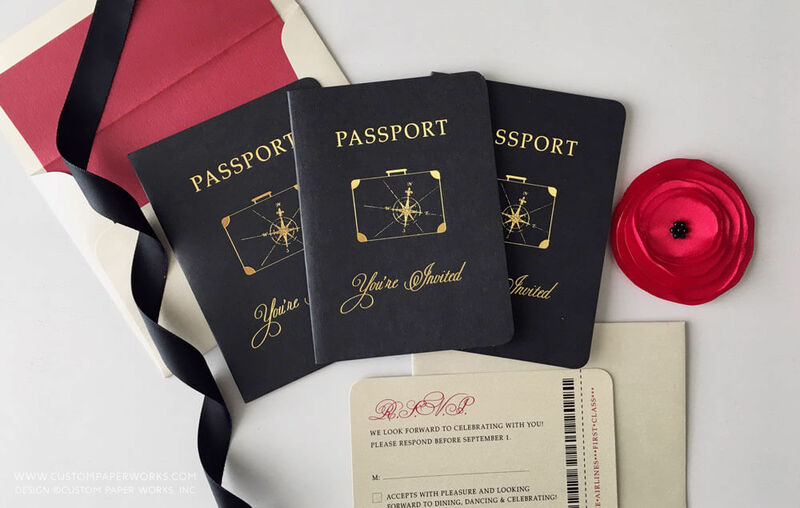 Their formal and elegant passport invitations carried out the theme with a gold suitcase and compass emblem on the front cover and on other wedding-day stationery items as well. 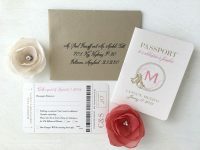 Keep scrolling to see their boarding pass / plane ticket save the dates that are no less elegant, and coordinating wedding programs, reception menu cards, and custom-illustrated thank you notes. 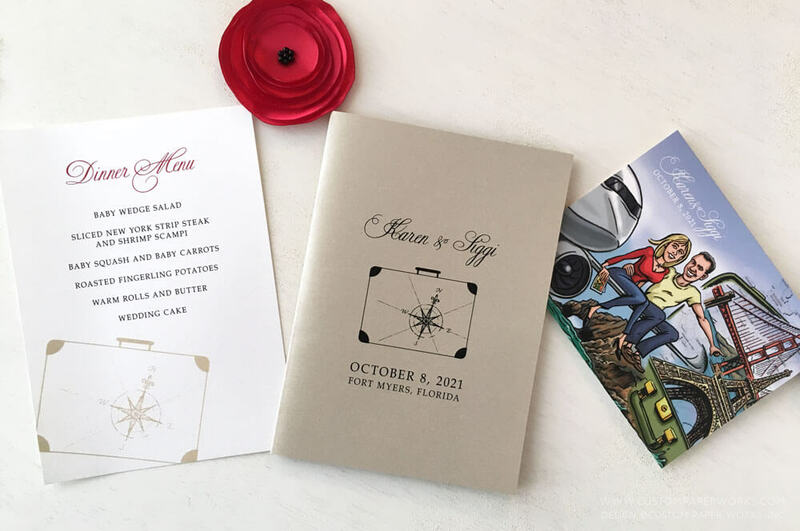 I really love the combination of a definitively travel-theme invitation that is STILL a formal and elegant invitation as opposed to looking more like a brochure that is overloaded with text and pictures. 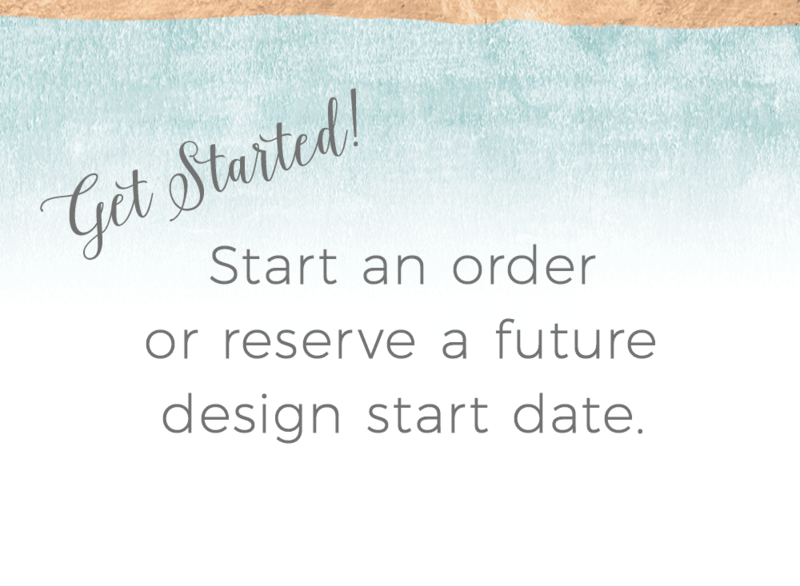 Custom Paper Works wedding passport invitations and save the dates always include your choice of paper colors and finishes (including envelopes!). Feel free to think outside the white & off-white box and create a unique richly-colored invitation specifically for your wedding. Reception dinner menus and folded wedding programs were designed to coordinate with their theme, and by request, an illustrator was hired to create a custom thank you note featuring places they had traveled together. 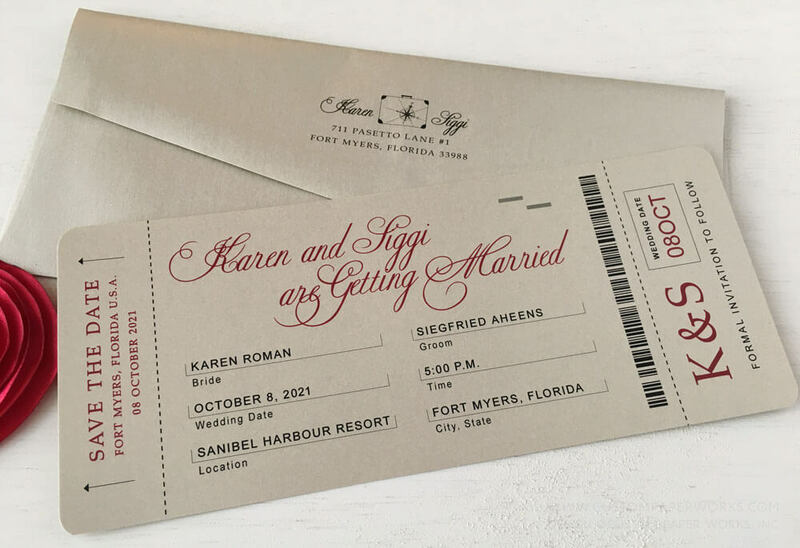 Their boarding pass / plane ticket save the dates were the initial piece that provided guests with a hint at the wedding theme, while still remaining as formal and beautiful as their Sanibel Island, Florida wedding. 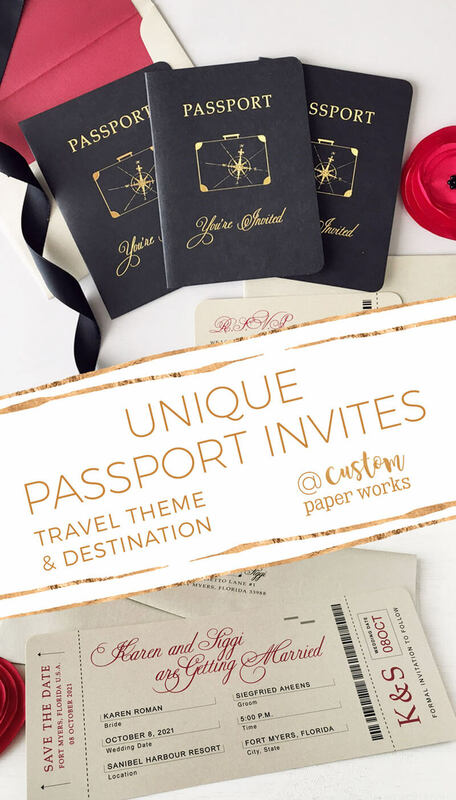 I’d love to create custom pieces as elegant as these for your travel-theme or destination wedding, and can help coordinate colors, sort out wording and address etiquette questions you may have too. Even when your look is formal, I like to keep the invitation design process casual, easy, and personal. Tell me about your plans and we can kick some ideas around over email.